The articles brought together here use anti-Jewish disputational literature to shed light on the rise of anti-Judaism in the West. Christian theologians at this time were particularly interested to work out the relationship between Christianity and Judaism because they were in the process of clarifying their own doctrines under the influence of classical material which had not been fully utilised since late Antiquity. In this context a response to the continued and vociferous Jewish rejection of Christianity seemed all the more urgent. It is not for nothing that the output of anti-Jewish polemics rose sharply towards the end of the 11th century and simultaneously became more and more sophisticated. Many of the anti-Jewish ideas of later centuries go back to what was formulated in the 11th and 12th centuries. 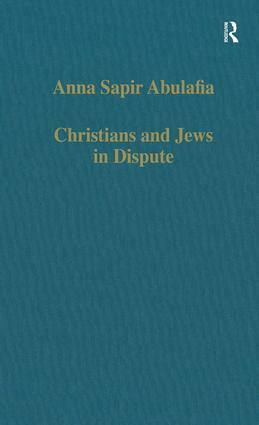 Contents: Introduction; From northern Europe to southern Europe and from the general to the particular: recent research on Jewish-Christian coexistence in medieval Europe; The evolution of medieval anti-Judaism; An 11th-century exchange of letters between a Christian and a Jew; St Anselm and those outside the Church; Christians disputing disbelief: St Anselm, Gilbert Crispin and Pseudo-Anselm; The Ars disputandi of Gilbert Crispin, abbot of Westminster (1085-1117); Gilbert Crispin’s disputations: an exercise in hermeneutics; An attempt by Gilbert Crispin, abbot of Westminster, at rational argument in the Jewish-Christian debate; The 12th-Century Renaissance: Jewish-Christian disputations and the 12th-century renaissance; Christian imagery of Jews in the 12th century: a look at Odo of Cambrai and Guibert of Nogent; Theology and the commercial revolution: Guibert of Nogent, St Anselm and the Jews of northern France; Jewish carnality in 12th-century Renaissance thought; Intentio recta an erronea? Peter Abelard’s view on Judaism and the Jews; 12th-century humanism and the Jews; The ideology of reform and changing ideas concerning Jews in the works of Rupert of Deutz and Hermannus quondam Iudeus; Bodies in the Jewish-Christian debate;The 1st Crusade and the Jews: The interrelationship between the Hebrew chronicles on the First Crusade; Invectives against Christianity in the Hebrew chronicles of the First Crusade; Index. The first title in the Variorum Collected Studies series was published in 1970. Since then well over 1000 titles have appeared in the series, and it has established a well-earned international reputation for the publication of key research across a whole range of subjects within the fields of history. The history of the medieval world remains central to the series, with Byzantine studies a particular speciality, but the range of titles extends from Hellenistic philosophy and the history of the Roman empire and early Christianity, through the Renaissance and Reformation, up to the 20th century. Islamic Studies forms another major strand as do the histories of science, technology and medicine. Each title in the Variorum Collected Studies series brings together for the first time a selection of articles by a leading authority on a particular subject. These studies are reprinted from a vast range of learned journals, Festschrifts and conference proceedings. They make available research that is scattered, even inaccessible in all but the largest and most specialized libraries. With a new introduction and index, and often with new notes and previously unpublished material, they constitute an essential resource.